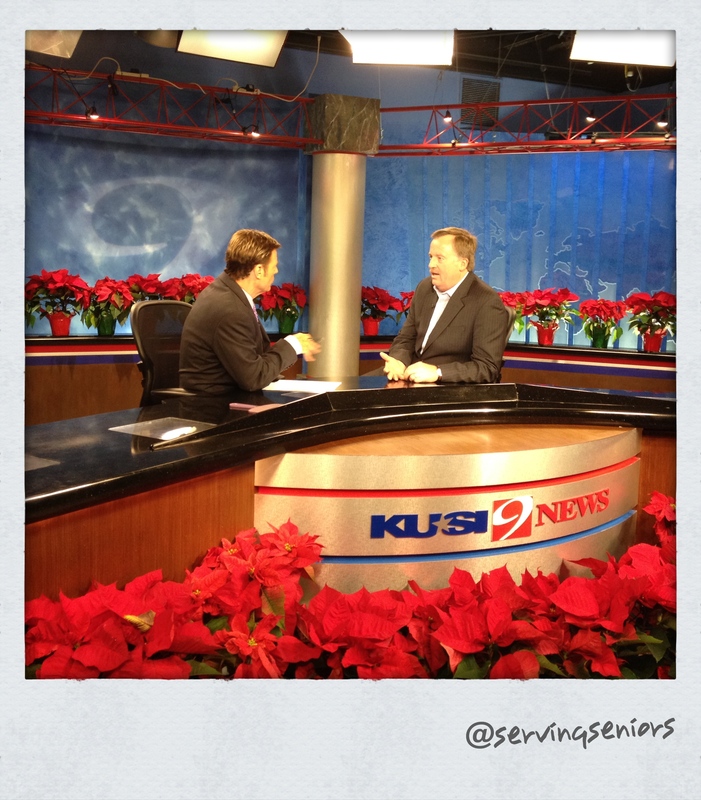 On Sunday at 10 a.m., please tune into KUSI/channel 9 to catch me on the station’s public information show “San Diego People.” One of three local non-profits to take part in the program, I was fortunate to represent the senior community and discuss the need for the public’s support to help nourish our local seniors through nutrition, housing, health and well-being. If you are interested in making a year-end donation to support San Diego’s low-income seniors, please contact (619) 487-0605 or donate online by clicking here . Today is the Fran Robinson Family of the Day at Senior Community Centers. Fran’s daughter Gail and son-in-law Jeffrey Donahue, want to honor their mother by making a $1,000 contribution to SCC and be the sponsors of the 1,800 meals that we served today. They chose December 27, as the Fran Robinson day because their lovely mother is in town and they all came down to serve meals to our seniors as a family. “Her energy and zest for life have gone to teaching us all many things as a mother. She always encouraged us to look on the good side of things and persevere and instilled in all of us the importance of being charitable and always helping others.” says Gail. Food from the Heart program at SCC was created to give families and groups of friends and colleagues, a way to express their philanthropy through the support of deserving San Diegans. 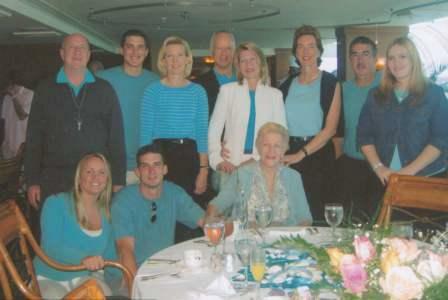 We thank Fran and her lovely family for making a difference and adopting our cause as the Family of the Day. Today there are 1,800 more full stomachs and smiling faces. Thank you! Editor’s Note: Welcome to Brent Wakefield, vice president of development, Senior Community Centers, who writes about his experience sharing our mission during a recent visit to a local Spanish-language TV station. Senior Community Centers was recently invited to appear on “Despierta San Diego,” a local TV news morning show on KBNT-TV, that exclusively delivers the news in Spanish. It was an effort to encourage the public to give financially to our organization during the holidays and to inform them of our newest initiative, “Food from the Heart.” So what better way to celebrate the season than featuring a demonstration of a simple recipe that we teach the seniors at the Gary & Mary West Wellness Senior Center. I enlisted the help of Yolanda Maldonado, one of our amazing volunteers to accompany me to the station and participate. On the way to the station, she told me that it was her first time ever inside a TV station and it was a real treat to be able to meet the reporters who bring her the news every morning. As we entered the studio to set-up, we were greeted by a mariachi band rehearsing before the show started. It was a great way to kick-off the morning and get us into the holiday spirit. We had a wonderful interview, sharing our Tuscan Bean Soup recipe with the viewers and Yolanda was able to express why she is involved with Senior Community Centers. 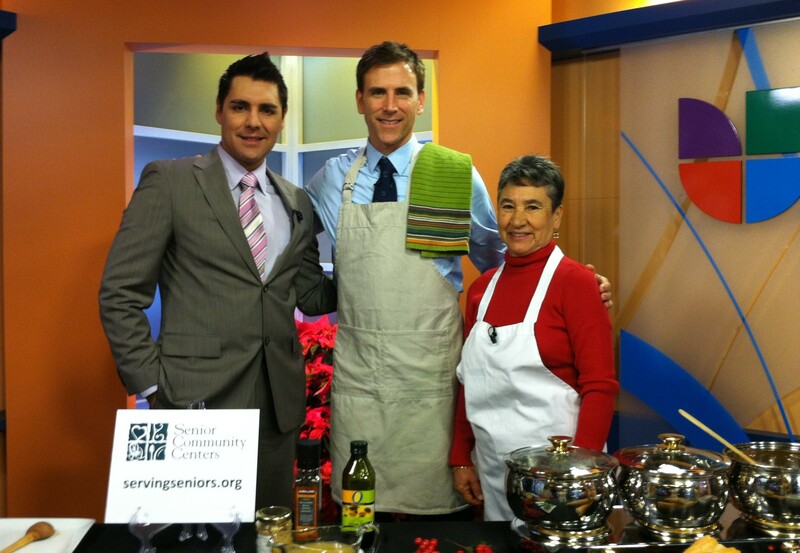 Here’s a link to our video segment so you can see our first morning show interview in Spanish. By working with KBNT-TV, we are able to share our mission with an even greater audience — to make them aware of our services and encourage them to support our organization during the holidays and throughout the year. Also, if you’re looking for the Tuscan Bean Soup recipe, you can download the English version here and the Spanish version here. The big news from Friday is the announcement from Senator Sanders (I-VT) office that he’s delaying introducing Reauthorization of the Older Americans Act until 2012. He emphasizes the importance of Older Americans Act in his reasoning to delay because people are focused on the Fiscal Year 2012 spending bill and extension of the payroll tax holiday. Go to http://www.servingseniors.org/advocacy/key-issues/oaa-reauthorization/ to read the draft version. During his visit he shared with viewers another way to feed people in need – “Food from the Heart” is our program where a family sponsors Senior Community Centers for a day. Understand Spanish? Or just want to see Brent partake in a side-career as a chef, watch the segment now. On Christmas, I plan to be at the Gary and Mary West Senior Wellness Center as I do most years. It is my extended family and I look forward to it. Yesterday, the seniors at the Gary and Mary West Senior Wellness Center kicked-off the week with their annual holiday party. There were raffle prizes and gifts given; as seniors enjoyed hot chocolate and cookies. Thank you to all who donated to make this little party a festive celebration. Christmas came early for many Chargers fans. Broncos and Raiders lose, Chargers beat up the Ravens to keep our hopes going for another week. Go Chargers!